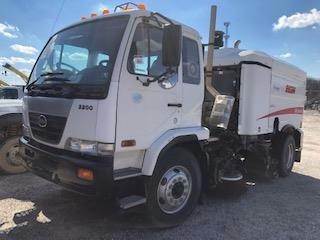 Description: ELGIN MV3000 Sweeper on a 2010 Nissan UD3300, 3' main Broom, 4 Cylinder Diesel, 230 Adv ... 2,500 RPM, Dual Steering Boxes, Nissan Engine, Allison Automatic Transmission, 173" Wheel Base, 4x2, 21,0000 Lb Rears, 32,900 lb GVWR, Air Conditioning, Cruise Control, Power Windows, Power Locks, Power Mirrors, Heated Mirrors, Dual High Back Seats, 8 Yard Debris Tank Capacity, 335 gal Fresh Eater Tank Capacity, Spring Suspension, Air Brakes. Separate Upper Engine powers Sweeper. Third Party Inspection Available including Oil Sample Analysis for both Engines.